This fall the U.N. conference on climate change in Paris (COP21) will try to make a difference: 20 years after the first conference in Berlin in 1995 it aims to achieve a legally binding and universal agreement on climate, with the aim of keeping global warming below 2°C. Since 1995 the carbon dioxide emission have doubled, and the goal to turn away from fossil fuel consumption until the end of the century reminds of economist John Maynard Keynes famous saying „In the long run we are all dead“, rather than a plan. 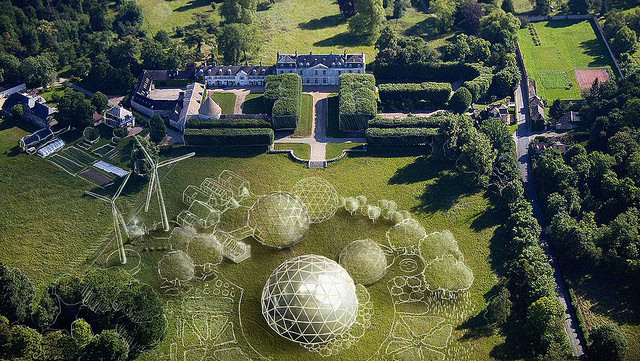 Against that background, ahead of the UN climate summit COP21, the innovation camp POC21, aims to deliver the proof of concept that a fossil-free, resource-efficient society can be built by citizen pioneers. “We’ve exhaustively discussed the problems – and even solutions to – climate change and resource depletion. What we lack are new formats and fresh minds to create feasible results for the vast majority of people.” said Daniel Kruse, co-founder of POC21. The organizers OuiShare (Paris) and Open State (Berlin) brought together around 100 citizen pioneers to join forces at Millemont Castle near Paris. During five weeks of co-making and co-living, their goal will be to prototype a new breed of open-source, sustainable products. 12 project teams – supported by international makers, designers and social innovators – will develop and document their ideas for a mainstream audience. During POC21 the participants will embrace a unique creative process complete with mentoring sessions, work sprints, reality checks, campfire chats and more. We can’t wait until the end of the century. It’s time to hurry up. fairplanet will report weekly from the innovation camp POC21. POC21 is running a live magazine to provide continues updates from the camp.